I know many of you will say how it is early to even start thinking about Christmas but I had to in order to get all things done before the “fever” starts. In most of European countries the Saint Nicholas day, december 6th is celebrated and is big event for children, as this Saint is gift bringer (and not to forget all the yummy cookies made for that day). Most of the Christmas fairs all around European main city squares will be opened at this time of year….it is just wonderful time of the year! For all of us crafters that means lots and lots of work and preparations before December 6th! Now you can understand how I didn’t start early! I started right on time! I have thought of few easy designs do be made. 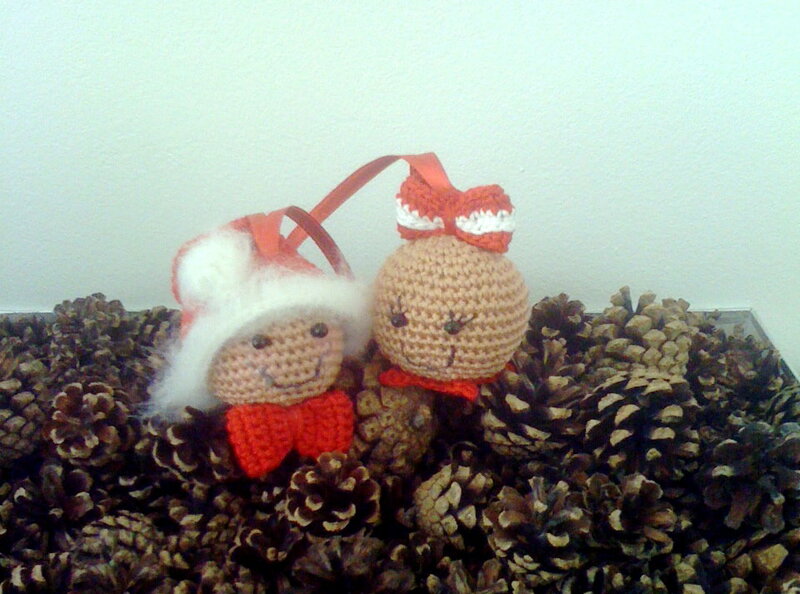 I have to make them easy in order to make them fast so I can finish them in time and prepare the sale during Christmas fair. All are done out of one basic head pattern and then the hats have made all the work. 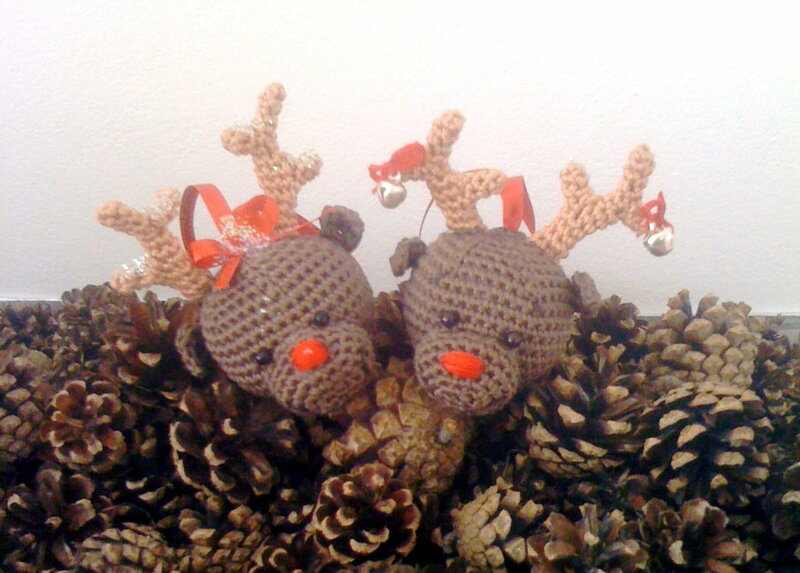 With reindeer is little bit more work to do with the horns but the final result is worth all the trouble. You can use these heads and Little Karlas bodes for example, and make complete tiny dolls if you like to have doll ornaments, instead of just heads. I wanted something little, cute and fast to do so I decided to go with heads only. The other option what can be done is mixing hats with heads and you will get many more combinations than ones presented here. 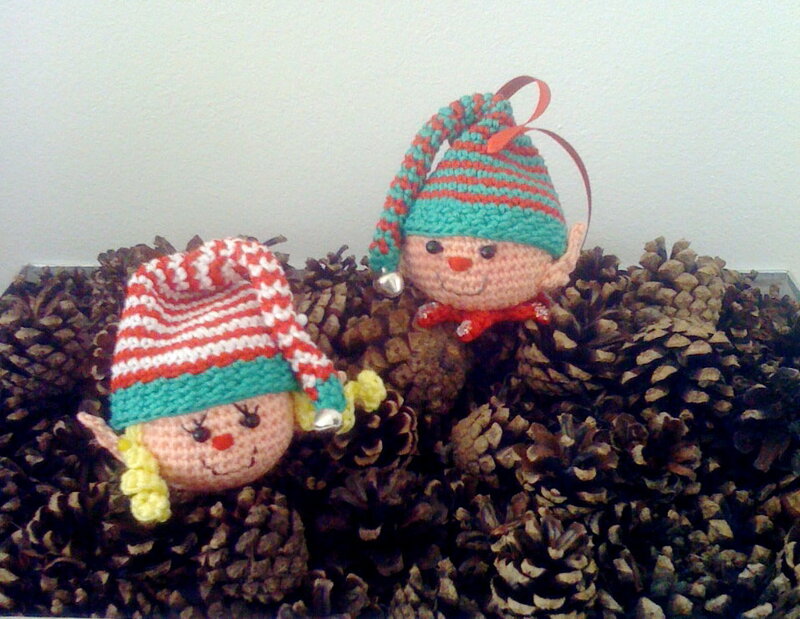 If you will have time, play, enjoy making these little ones you kids will love and will make great addition to you christmas tree. Think we can start with the patterns. Will give you as many details as possible. If you will have any further questions to ask, feel free to leave me message here or send me mail. Will be glad to help! Tie off leaving long end for sewing. Sew/close the last row and hide ends. Once you finish the head, and close the last round nicely and clearly, turn it up. The last row will be up (will be covered by hat later). For those that will sew the eyes as I did will be easier. Place the eyes between the second and third middle row (those of 42 stitches count). With red yarn embroider the nose one row below the eyes. Embroider or paint the lips and as final touch add blushing on the cheeks. Change color at the last stitch of the previous row. You will change it following way. Push the hook through the stitch, yarn over and pull the working color yarn. Now you have 2 loops on the hook. Change yarn color at this point to one for the next row and pull thorugh both loops in order to finish single crochet stitch. Continue with next row. In the same way, continue changing the yarn color at every row. R38-R40 sc44 following way (one stitch back loop, next one front loop. Work this way for entire row. Overlap the bl/fl for the next two rows as well. If you start with back loop at the first row (R38) start every following row (39 & 40) with back loop stitch as well. If this seems to complicated, stitch the last three rows in plain single crochet through both loops. *sc1, ch5, starting at the second chain from hook sl st1, sc1, hdc2, slip stitch to next stitch* repeat until all 5 points of the star are made. Tie off, hide ends and sew or glue on the bottom of Elf’s head. Decorate with glitter, beads or anything you like. For hat decoration I used white/red twisted yarn pieces I placed under tiny crocheted wreath I made by making 8 sc in magic ring, slip stitched last to first stitch and tried not to close the ring to tight. You can use beads, buttons, glitters, bows…play a little and experiment. Decorate the smiling snowman the way you like. Tie off, hide ends and brush well top of the hat and bottom edge. R4 flatten the piece and stitch through both sides (should make 2sc). Tie of leaving long end for sewing. Instead of embroidering the nose, sew this one on the Gnome’s had. In order to make gnome’s hat longer, what you will do is repeat each increased row. For example, if you increased working row is 8 sc, the next one you won’t increase, but will repeat same stitch count. Gnome’s hat has no fuzzy edges, so make it all one colored. 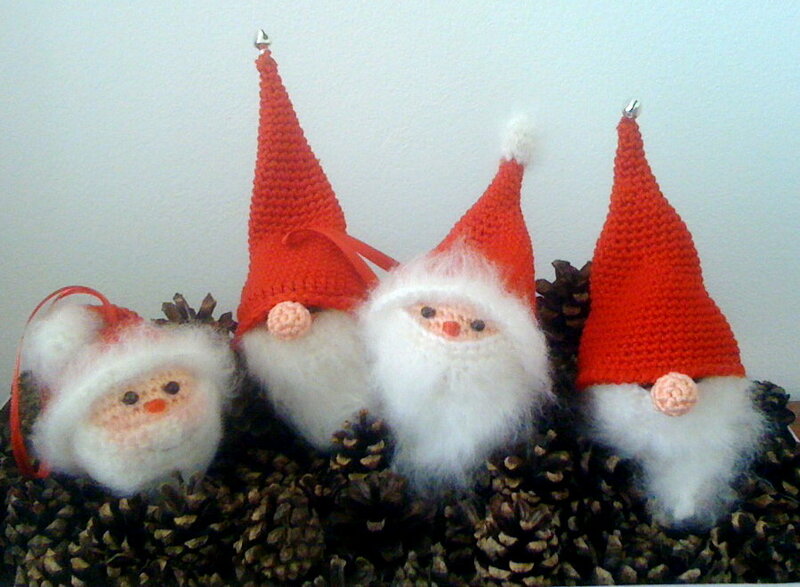 Add one or two extra rows at the end so the hat falls more over Gnome’s eyes. Tie off, stuff, pin and sew onto head. 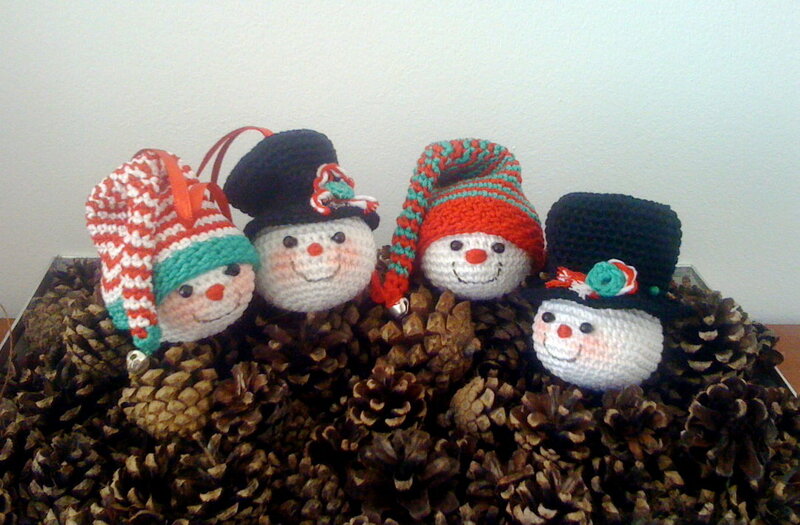 On top, with red yarn and embroidery or darning needle embroider red nose. GingerMen heads are just in addition to all above! One is using Santa’s hat. Girl has Elf’s collar. You can really use many different variations. Tie off, sew ends together. Use yarn to wrap around middle in order to create bow. Tie off, sew the ends, create the bow. Now we can all start making ornaments! Wishing you all the happiest weekend! There are two options. If making boy elf follow the boy hair pattern. For the girl you can choose one given for girl elf, or you can choose and make any of the hair patterns I posted in my free patterns. So instead of looking for the pattern you like, look after hair style you like, download it and use it for your elf girl. I recently found your blog and think your work is great.I’m well into my Christmas crafting.I did struggle with the deer horns at first. 1 because my hook kept bending(aluminium), so I dug out an old steel one and discovered the aluminium one was actually badly sized anyway. Secondly I had difficulty holding the small horn due to arthritis. This was solved by adding an extra row to the small horns.I was surprised what a difference these changes made. I’m now a happy bunny with my deer. I can imagine how frustrated it was to make the little horns. Repeating few stitches in rounds is not easy for healthy hands and fingers, so can imagine how you’ve struggled to get them done. Next time, instead of adding one extra row, try adding one extra stitch, but when doing so, try keeping gauge tighter. This way the difference will be slight and will be easier to work (with this extra stitch in one round). Another option to add horns is, instead of making little ones and work them together onto big ones, start the circle of little horn directly on finished bigger one. Work towards the top, close end and hide thread. Hope it makes sense. Whenever you find small work like this, that is difficult for your hands to hold and work on, try to find the way to make it more simple and easier for you to complete. Important is to get the work done. Thank you for your message and best of luck with your Christmas crafting. Thank you for your advice. Getting on well now .I have a large collection of heads and hats. They look great when assembled.